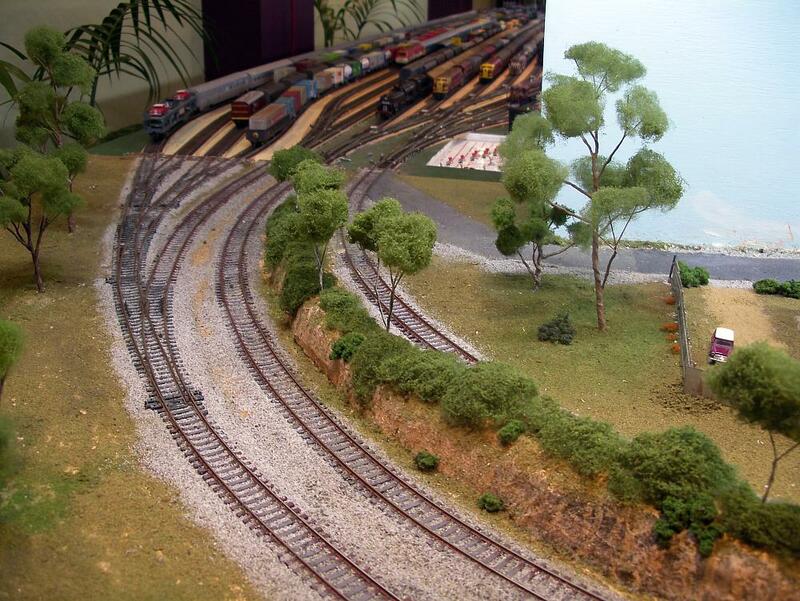 An overview of Wallerawang's modified storage yards, with the rear of the stabled coal train in the foreground. Modifications to the storage yards continued after our traditional break over the New Year period. All the points were laid, flextrack run to the existing shorter tracks, with the rails then soldered onto printed circuit board and cut at the module joins. Re-wiring of the trackwork then commenced. 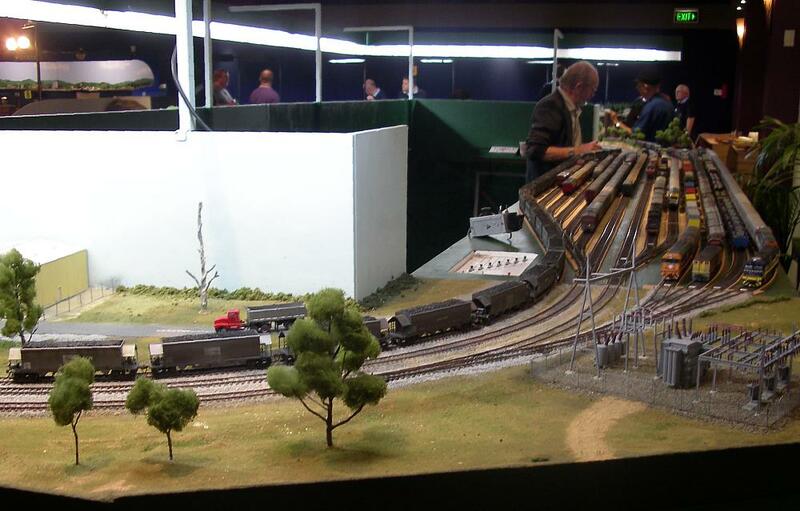 An additional 20-pin connection at each yard end was required to cross the track and points power over to the end modules. Two pairs of ex-PMG plugs and sockets were pressed into service and two more jumper cables were wired up. The Peco Electrofrog points had already been prepared for live frog track wiring before being laid, so it was a matter of running wires from the Tortoise auxiliary switches to each frog and point rail. As track power to each yard is fed at the yard lead and then routed by the Tortoise motor switches to each yard track, it was necessary to sit down and plan the exact wiring scheme before putting solder to iron. At the same time a wiring plan for the new plugs was also devised, making the cabling an easier (but no less time consuming) task, and allowing us to troubleshoot any connectivity issues more easily in the future. Left to right: the new yard ladder for entry to the Down storage tracks, the Up Main, and the Mudgee branch. The diode matrices for each yard lead also required redesigning, and each matrix board was taken off and reworked to suit the new point arrangements. The boards were then screwed back on and the existing wires to the pushbutton switches and point motor drivers reconnected. The wiring from the point motor drivers to their respective motors was modified as necessary, and all the yard leads were tested separately for correct operation of point direction and track power routing. After each yard ladder was tested, the sleepers and rails were then painted and the track ballasted. The new yard debuted at the Merrylands exhibition earlier this month, and operated with little fuss. 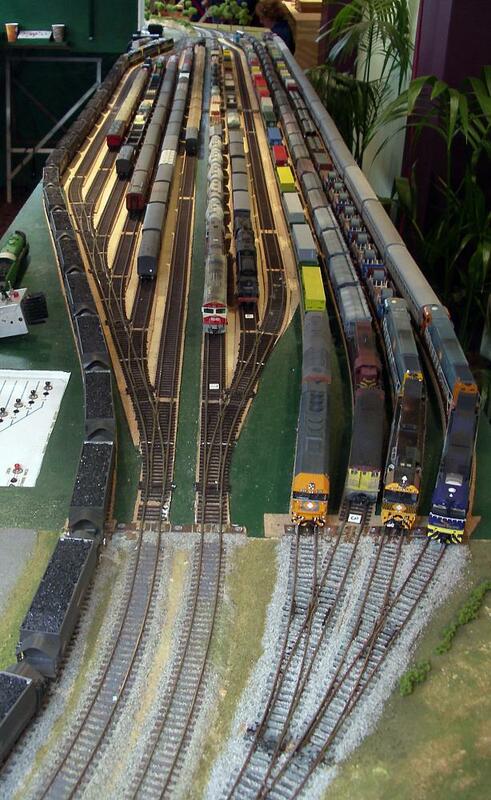 An overhead view of the yards, showing trains that are now of a more prototypical length stabled and ready to run. 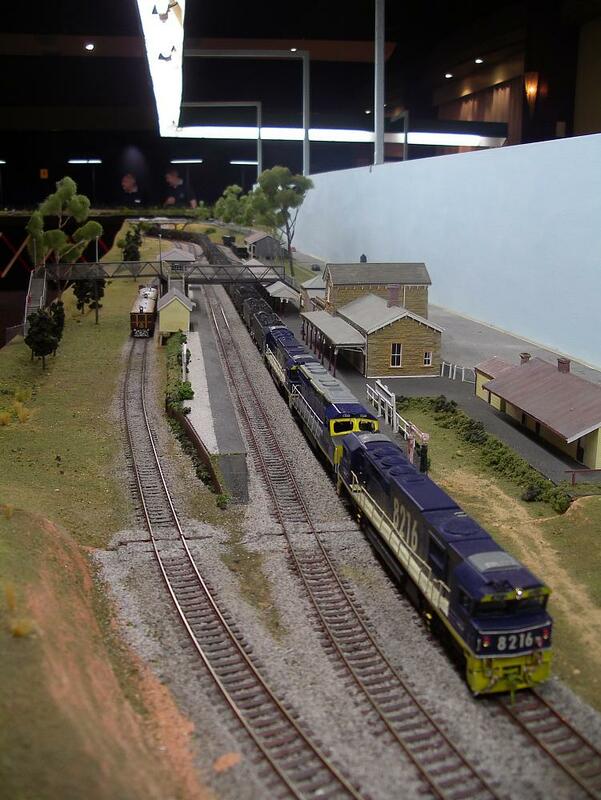 An image of the yards in their original form can be seen in the Wallerawang Image Gallery. During this period greenery was added to improve the scenery. Many handmade small and large trees were planted, along with shrubs and tufts of grass. Some bright green tufts were given a lick of purple paint along their tops to represent patches of Patterson's Curse. One of the slopes which spans two modules was reinforced below the plaster shell with plywood cut to the correct profile, and the hillside and road worked to suit the now more stable join. 8216, C504 and 8215 are reduced to a slow speed through Wallerawang station as their coal load clears the Mudgee branch points. This view also shows the overhead lighting system and the poles which hold the valances in position.